It’s that time of year again…the Sephora Beauty Insider Sale! You can save 10-15% off of your ENTIRE purchase!! I don’t know about you, but I will use ANY excuse to shop and since Sephora is basically like my second home, I will take all the savings I can get. 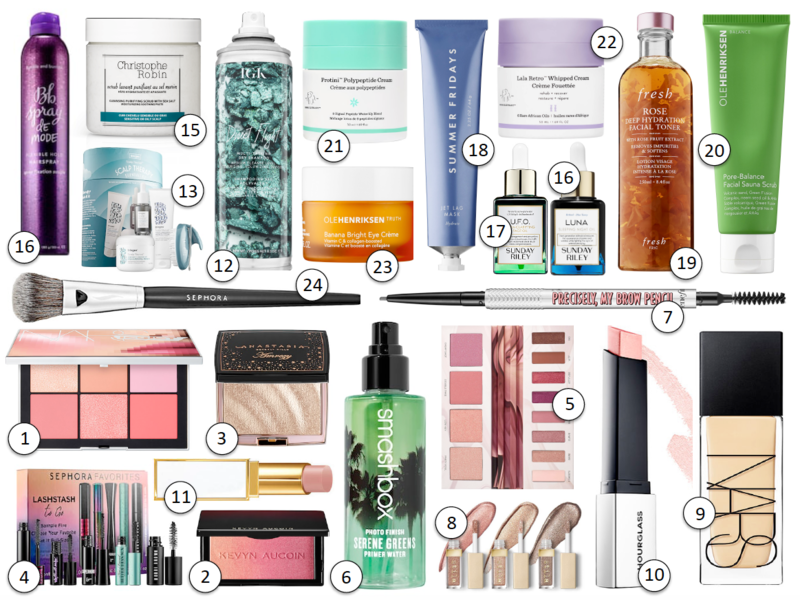 Lately I have gotten tons of comments and DM’s requesting my Sephora Sale shopping recommendations, so here they are! A beautiful set of 6 blushes with matte and shimmer finishes containing shades perfect to rock throughout spring and summer. Although a little pricey, this baby had endless combinations of colors. They are super pigmented and blend like a dream. My personal favorite shades are Pink Sand and Rose Cliff. Apply this and then set with a setting spray in order to achieve golden sun kissed goddess status. By setting it with a wet spray, it melts into your skin and makes you glow for days!! I am a total mascara junkie, I just want them all. Wether you just want to stock up your stash or are on the hunt for the perfect new product to plump up your lashes, this is the perfect set. With beautiful shades of pinks, purples, mauves and browns this palette is the perfection addition to your spring and summer makeup bag. Literally the only brow product you will ever need. It can be used to create soft natural looking brows or bold defined brows, the possibilities are endless. The Rose Gold color is my obsession! The perfect color for spring and summer and blends so beautifully into your skin for a popping glow! I am not kidding when I say I spent YEARS searching for my perfect everyday lip color, I seriously almost cried when I found this one! Literally the best dry shampoo you will ever use! Especially if you have long or thick hair, this baby is a life saver! Perfect for dryness, dullness and uneven texture. It smells like a dream and after using it, your face will feel softer than a babies bottom! Besides being the most beautiful toner of life and containing actual rose petals, it removes impurities, refines pores and softens skins. For my fellow moms who lack sleep or just anyone with dark or baggy under eyes, this is your new best friend! A self heating face scrub that not only clears up your skin, but makes you feel like your getting a facial every time you use it. The ONLY brush I use to apply my foundation. It gives beautiful even coverage, takes seconds to apply and gives the most gorgeous finish to your skin!